On August 6, 2017 Kevin married his sweetheart, Emily Bryant. 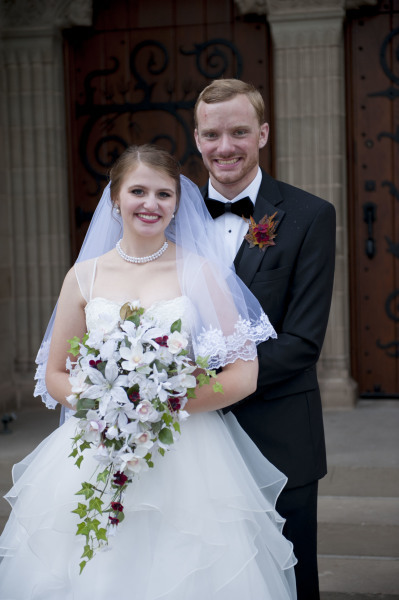 They were married at Shove Chapel in Colorado Springs with the wedding reception at Meridian Point Church in Peyton, CO. Kevin is employed full time at Layer 3TV in Denver, CO. Emily is a massage Therapist in Colorado Springs. They currently reside in Colorado Springs. Kevin commutes to Denver on a daily basis. Since Kevin is now living in the adult world there isn't a lot of free time. HIs down time is now spent with his true love, Emily. Kevin and Emily do manage to come back home for occassional visits. This is bittersweet. Kevin is grown up, married and on his own. We are so PROUD! Yet we all miss seeing him everyday. Thankful God chose a Godly beautiful woman for him to share life with. He is a sensitive, compassionate, energetic, enthusiastic, full of the joy of the Lord young man. He is always looking for ways to please others, sometimes even sacrificing himself to make others happy. He is very serious about his commitment to God and others. God blessed him with an equally amazing woman of God. Kevin's natural talents are woodworking and light design (which he learned from his Dad). He has followed in his dad's footsteps in the lighting industry. Kevin and his new wife, Emily attend Charis Christian Center where Kevin enjoys volunteering as light designer.